Pearl Barley—one of the world's oldest and most treasured grains‚ is used by cooks and chefs around the globe. Pearl Barley has the bran partially removed before it is polished, resulting in a smooth surface and quicker cooking time. 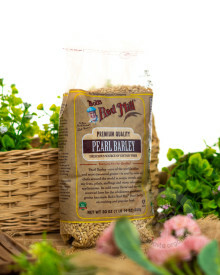 However, pearled barley retains significant amounts of fiber, because barley contains fiber throughout the entire kernel and not just in the outer bran layer. Pearl barley is very versatile and lends itself to a variety of dishes. Add pearl barley to soups, stir fries and stews in place of rice for a tasty change. It can also be cooked up as a hot cereal, stirred into salads, or used in stuffings. The mild nutty flavor and tender chewy texture is also wonderful in pilaf or risotto. See the back of our package for two scrumptious recipes using Barley—Pearl Barley Salad and Chicken Soup with Barley. Customers tell us our Pearl Barley is a great addition to our Vegi Soup Mix. Or, try our Pearl Barley in Scotch Broth, the quintessential Scottish soup made with pearl barley, lamb, and root vegetables. The options are bountiful!